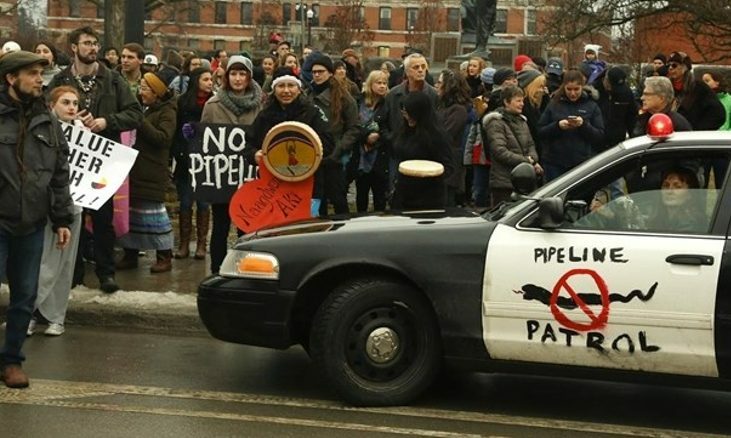 A fairly disruptive demonstration took place in Nogojiwanong/Peterborough on Tuesday, January 8, 2019. The event was organized and led by Indigenous women in response to the call for a day of action in solidarity with the Gidimt’en Access Point and the Unist’ot’en Camp in unceded Wet’suwet’en Territory. ‘Peterborough Solidarity with Wet’suwet’en’ began at 3:30pm at Confederation Park. After an introductory welcome and acknowledgement, and some speakers, those gathered moved into and occupied George Street, disrupting traffic on an arterial one-way street leading into the downtown commercial district. The street remained occupied and closed to traffic at George and Mcdonnel Streets for at least an hour. People played drums, sang songs and collectively expressed solidarity. The Peterborough Examiner reported 200+ people attended the demo. The police were on the scene but did not take action to move people out of the street. Colonially named Peterborough is located in Michi Saagiig Nishnaabeg Territory. It is known in Nishnaabemowin, Nishnaabeg language, as Nogojiwanong. It means “place at the end of rapids”. A second one blocked Hunter Street Bridge on the 19th. Must have been around 75 people in the freezing cold.